Travel in style with this sophisticated medium tote bag and matching wallet. Available in a range of colors to match your wardrobe, the bag and wallet feature goldtone details for a chic touch. The tote offers plenty of storage, while the long shoulder strap ensures easy carrying. The wallet features a range of slots, pockets, and compartments to organize your belongings. This bag is really pretty I have the black and purple one. I have chronic pain, so it seems I'm required to carry a lot of stuff to help with it (I don't use many Rx meds) I carry everything from heat patches to rubs to wraps and on bad days which is almost everyday I carry a heating pad. Plus of course all the other purse stuff. I was carrying a purse and a tote bag, now I only have to carry one most of the time. And did I mention it's really pretty? Beautiful bag! Very roomy, it has a zippered pocket inside large enough for your phone. Smaller open pockets on the other side to hold a pen, lipstick or other items. It’s sturdy, practical and can be used for everyday but I used it as a dressy bag and it was perfect. I carry an iPad, bottle of water, wallet, and many other items, and it has plenty of room. The colors are rich and very pretty. It comes with a wallet that holds credit cards, license and pictures, the wallet can be used on its own as it comes with a strap. Very good purchase for me, I really like it. I love my bag and my wallet. Bag has enough small pockets to keep items like phone, keys, business cards and more separately, which makes it easy to find them. It keeps shape and It looks great. I received many compliments on. Wallet is very practical and comfortable. 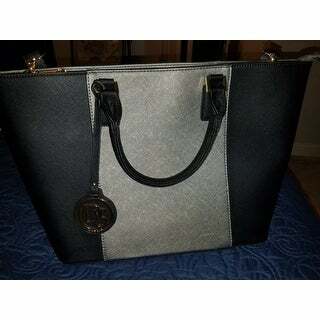 I purchased a black and gray tote bad. Its very nice in color and appears to wear well. The tote is very spacious inside and has compartments to utilize. I love my new tote bag. This is my first time owning one of these and I have to say, this is one of the best tote bags I’ve ever owned. Looking forward to getting another only a hand bag. Love this. The matching wallet is a plus. Great quality for the price. Good size handbag and the wallet has several pockets for cards and cash. Will buy in different colors for my moms birthday. I love this tote. I carry to work. I purchased the silver/black. It serves as my briefcase and purse, in one. Great quality and very classic design. I receive so many compliments on it. I recommend. Love the size and shoulder strap. I use a cane for walking and a purse/bag with just handles was so ackward to carry. This is perfect. Hands free and looks good. Holds all my "essentials", a book, bottle of water and a sweater! I got black.white. Works with everything. LOVE THIS PURSE! It's the perfect size. I use this for my laptop and files.... It is really good looking and stands on the floor or desk without falling over! Love it ! The color is perfect ! Great quality! Beautiful purse ! Loved the look! So me!